Cracoe BOFRA:- It's regrettable that BOFRA events aren't traditional in the Peak, whence more from the club could enjoy their secrets. Very simple in essence, and Cracoe - up Wharfedale- is typical. Start touch the top, and finish. Two walls to negotiate, and an abundance of rough stuff. Results. Inclined to Madness - results. Results. From Kate’s Race – Isle of Man. English AM Championship. Problems were caused by the morning mist over the airport, so plane(s) circled round waiting, and deemed it too dangerous to land and returned home. Hot, clear and dry. They had put on an excellent, hard course, starting at the beach at Laxey, to finish on Snaefell summit. For an uphill race there were some big drops to be negotiated. For those who, like Carshare, had never been to the Isle of Man, it’s a very pleasant scenic place to be visiting. Tal y Fan - results. Addingham Gala – up Beamsley Beacon – again.. results. Saddleworth Round – a new addition to the calendar..
Viking Chase – N.Y.Moors:- results. Monday – Summer Series 8 – Wicken Wizz. Blackfell – another complete AM classic, from Kettlewell. Only a small field, with several other "attractions" around. Likely this will change if...it is selected to be Championship next September. If.... No trouble finding the almost decent lines today, but hopefully the clag will be down over Great Whernside, and runners will be all over the place....Results. Summer Series 7 – Moscar Moor. Golden Acre Park Relay – teams of 3, sign up on the day , very popular around a wooded Leeds park. And this year a Junior's Relay......results. Relays..... a good while off as yet. The Hodgson Brothers Relay is 7th October, four paired legs, from Patterdale. Likely the usual Men, MV40 and Women's teams, as there is a tight limit on entries. Most definitely a course for people with Lakes hills in the legs and the ability to thrive in bad conditions. The UKA British Relays are from Grasmere, 20th October. Details and route descriptions. Just now we have Men, MV40, MV50, Women, WV40 teams. Maybe nearer the time it might be possible to enter additional teams, if it don't get over-subscribed. Team selection is always hard, and a proven track recent record over similar terrain is a considerable help. and Dicky Wilkinson V55 gold. Saunders Lakeland MM - results. Up The Nab – Juniors Championship events - all results. Wharfedale 2Peaks – or 3Peaks – from Kettlewell, in support of the Mountain Rescue. Only two peaks for Carshare, Buckden Pike and across to Great Whernside. The moors bone dry, and even those bogs dropping off Great Whernside. Another attempt at the optimum line off Great Whernside, all worth a try. Results. Danefield Relay – teams of 3 around Otley Chevin. As popular as ever, with football updates as we passed the various marshals...results. British and English Championships - after Buttermere. After Buttermere. - FRA Link. Senior Women:- Megan – 5th. Senior Men:- Rhys – 2nd. MV40:- Dave Taylor – 8th. MV50:- Dave Taylor – 3rd : Spyke – 4th. WV45:_Helen – 3rd : Nicky – 11th= . MU23:- Max – 2nd : Nathan – 3rd. MV40:- Spyke – 7th . MV45:- Spyke – 4th= : John Hunt – 6th. MV50:- Spyke – 3rd : John Hunt – 4th . Buttermere Horseshoe – English and British AL race. Results. Winster:- results , with a good bit of fiddling around..
Clougha Pike:- Seniors and Juniors results. Great Lakes Run:- Lewis has kindly sent a copy of the results along, as ever an enormous help. Looks to have been a trifle damp and misty up there, but surely not as bad as a few years back? Or was it? Settle Hills:-It's a scenic run around Attermire Scar. some strong enough climbs and plenty of running. just add in a mixture of tussocky stuff and limestone paths, and we're in for a treat. Results. British Championships - after Wales. Tal y Mignedd – AS British Championship. Looks to be a short, sharp blast up and down. No attendance from Carshare, regrettably, - I’ve returned the entry. Under strict instructions just now not to be falling over….Results. Ennerdale – the next Lakeland Classic. results. Wednesday – Burbage Summer Sharpener 1. Thursday – Blacka Moor Chase - results. LAMM – up in the Isle of Harris. Results. and reports. The final and last LAMM? Wharfedale Half Marathon - results. Welsh 1000m. results. I can't just be seeing any of us there? British Athletics Mountain Running Championships - Juniors results. Otley Chevin – how could anyone miss out on this? As simple as it gets. Start. get to the top as best we can, then hurtle back down. Success for Carshare , under the requirements. I didn't fall over - but not much more..,. West Nab:- all results - Seniors and Juniors. Helvellyn and the Dodds – Carshare League Counter. - results. Simon’s Seat – another of those quietly excellent AS courses, up Wharfedale. The first ever race was a "chase the bride" race, and similar was this year's. The bride,(Emma Dodd), suitably attired, set off 20 mins early, leaving the groom (Sam Watson), rather too much to catch his bride, with usurpers Ian Holmes and Ted Mason also chasing hard. As ever, the compulsory pint to be drunk before crossing to the finish. As good a race as it gets....results. Kong Mini Evening:- Dovedale . results. Malham Kirkby Fell – and Juniors. All results. Old County Tops:- and a long-standing Men's record broken. Trent 5 - details. and results. This is a five mile shift around the flatlands of Nottingham, with John Hunt being chased home by Graham Moffatt. Fairfield – the next Lakes Grand Prix event. Please let me know should anyone find any scores for this, or even from last year...Results. Pendle Cloughs – dry, warm, even sunny, something unheard of for Pendle races. A race I can't recommend highly enough. Starting from the scenic village of Downham, a wander all around Pendle, and needing something called navigation. With determined efforts from the organiser, a more respectable number of runners this year. Just as hard as The Tour, but having to find the way. On next year's list? results. Summer Series 3 – Bamford. Sunday - Clough Head - English Championship 2 . results. Full credit to Keswick for a well-organised, hard, classic AS race. Clear, hot, and dry underfoot. Peat Pits Wood 2:- results. Jack Bloor - over Ilkley Moor:- the hot weather hadn't reached the swamps of Ilkley Moor, in places as sinkable as ever. But we were serenaded by the clear call of the cuckoo...results. 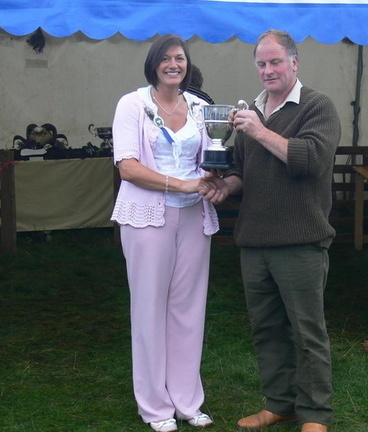 Notts Fell Championships - details After Wolf's Pit was cancelled, it will now be at Chrome Hill on Saturday 30th June. Senior Women:- Megan – 13th. MV50:- Dave Taylor – 3rd : Spyke – 5th. Anniversary Waltz – the second race in this Lakes Grand Prix:- results for both races in due course. A most memorable finale for the race organisers, with expressed hopes that the race will continue next year. The first hot day, so plenty of thirsty runners , especially on the longer Teenager...results. Teenager with Altitude – what better way to be getting ready for Buttermere Horseshoe…results. Blacko Hill – Junior Championships - results. Dungeon Ghyll:- one of the more serious AS races, where them not expecting full kit checks seem to have been caught short. Simply get up Harrison Stickle, then find the way down. But finding the pathless descent in the mist isn't easy and a good few missed out one of the checkpoints. A classic Lakeland race, only £4.00, and hopefully a bit warmer with no snow flurries for Coledale next week...Results. Peat Pits Woods – 1 - results. Grisedale Grind:- results. Due to bad weather the course was shortened, and no times were able to be recorded. Boulsworth Bog:- the clue was in the name - "Boulsworth Bog". If you've not heard of it, sometime try calling in at Wycoller, a hamlet not far from Colne, with a class café and a series of heritage bridges over the stream. The crossing along the top was like Brown Knoll without the slabs, classic stuff indeed. With the mist down, several might still be up there.....Results. Todd Crag – English Junior Championship Counter:- results. Friday – yes, Friday – Howgills:- that long, long Sedbergh race. Results. For the MV60 and W50 teams, the tables have been filled in, but it is clearly stated that there must be 4 teams completing enough counting races. The MV60 have only 3, the WV50 have only 1, so somehow we need some more teams getting round the other AL race, Buttermere. Senior Women:- Megan Wilson – 10th : Nicky – 11th. WV40:-Nicky – 3rd : Helen – 6th. WV45:_Nicky – 2nd : Helen – 4th : Jane Crowson – 10th. WV50:-Nicky – 1st : Jane – 3rd. MV40:- Spyke – 8th : Tom Pape – 11th. MV45:- Spyke – 4th : John Hunt – 8th. MV50:- Spyke – 1st : John Hunt – 5th : Mike Nolan – 8th. MV60:- Keith – 6th : Dave Holmes – 11th. Applications to enter the Spine Races (full Spine Race and the shorter Spine Challenger) are already open for January 2019. It is likely that places will fill up quickly so for those interested it is best to apply early and if accepted a place can be booked. The 2018 even can be re-played (http://live.thespinerace.com/) to see the course, map and the race in progress (top left buttons fourth one along) and entries can be found at https://thespinerace.com/application/ at least one Dark Peaker has already signed up and I suspect that others have already done so or are about to. Cautley – Kendal Winter League.